Save $70 when you buy the package! Buy all three books to create a comprehensive program resource that meets the needs of your professional development staff, preceptors, and new staff members. The definitive preceptor training program for all specialties. The pocket companion for effective preceptors! The perfect onboarding companion for new preceptees! 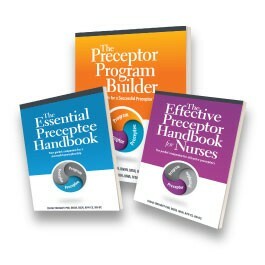 The Essential Preceptee Handbook provides new staff members with the guidance they need to build supportive one-on-one relationships with their preceptors and acclimate to the work environment and culture.